POSTED: Mon, 03/31/2014 - 05:00 | POSTED BY: Traci C.
Waiting for a Disney bus to take you from a resort to a theme park can often be a frustrating guessing game. But, guests who are waiting for the bus at Disney's Animal Kingdom Lodge Kidani Village no longer have to guess on the bus arrival time thanks to the digital arrival screen that is available at the bus stop. Our friends at the AKL Resort website wrote about the new Disney Transport bus arrival screens after spotting them on a recent trip. 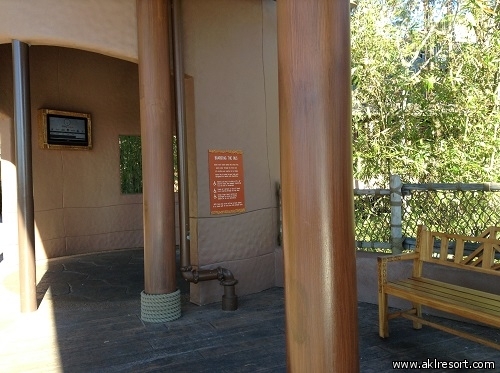 The Disney Transport arrival screen is located in a small enclosed area next to the benches at the Kidani Village bus stop. The estimated arrival times for buses headed to the Magic Kingdom, Epcot, Disney's Hollywood Studios, Disney's Animal Kingdom, Downtown Disney, Typhoon Lagoon, and Blizzard Beach are all listed. The arrival times for the buses change as the buses are en route to the resort, but according to our sources once the bus did arrive the time was nearly spot-on accurate to the arrival time listed on the screen. Have you seen the Disney Transport screens at any other resort on property? If so, leave us a comment and let us know! These screens are very helpful. I just wish they would put them at the quick services restaurants. So when I am getting my breakfast in the morning or refilling my mug, I know if I need to rush to the bus stop areas. We didn't see a screen but there was a college intern at the Pop Century when we were there and he told us when the bus was going to come in and he was right on time. It was nice to have an idea of how long you had before the bus got there. We had a young CP at All-Star Movies who let us know the bus to HS had just pulled out from All-Star Music. It was nice! Hoping they have the digital bus system up at FW when we go in May! I saw one of those screens at Jambo House last November. It was very accurate. Although, we've always had good luck with bus timing. Usually after a day or so, you can anticipate them, especially on the resort end. We saw them at the Grand Floridian in October. They were installed while we were staying there. It was a great convenience to us anxious guests to take the guesswork out of it. I would agree with Andrew though, I wish they would install them in an additional place (maybe at the quick service restaurant) inside of the resort or even better be able to access it on your in room tv! There was one of those screens at Port Orleans Riverside. It was very helpful. They've been at Kidani for months... they had them when we were there last October. The screens are great... no wondering when the next bus is going to come (and if you forgot something you know if you'll miss a bus by going back to get it). Jambo didn't have them back in January. It would be great if they would get them rolled out to every resort. I saw one at Port Orleans-Riverside in November! They have bus wait time screens like this at the Grand Floridian, too!